SAN FRANCISCO, CA--(Marketwired - May 13, 2015) - Maker Faire Bay Area 2015, the Greatest Show (and Tell) on Earth, is taking place Saturday-Sunday, May 16-17, at the San Mateo Event Center in San Mateo, CA. This event marks the 10th anniversary of Maker Faire and a decade of Making in the Bay Area. Celebrations and retrospectives will take place all weekend long as Faire attendees, Makers, and Maker Movement leaders take a look back at the amazing journey of the Maker Movement. Attendees are encouraged to access these resources ahead of the event to plan their time at the Faire and take advantage of all there is to see, do, and learn. Storage lockers will be available for the first time for attendees to reserve for a nominal fee and store their belongings on-site in a safe location. Reservations can be made online in advance of the Faire or on-site until space is sold out. Locker space is available on a first-come, first-served basis. Arriving by Car, Parking Options, & Directions: Expect delays and congestion around the Event Center, including Highways 92 and 101, the day of the event. It is highly recommended that attendees plan ahead to make use of off-site free parking and shuttle options. No on-site parking is available at the Event Center. The San Mateo Bridge is open and operational all weekend. Google joins Maker Faire Bay Area as a Goldsmith Sponsor, demonstrating its leadership in the Maker Movement. Making is a key thread in the fabric of Google's corporate DNA and it will showcase for Faire attendees what Google employees are making. Google's 'Making Science' area will show early iterations of Google products, including some amazing personal projects from Makers at Google, as well as what its Making Science team is doing to support scientists, Makers, and kids of all ages. Also on hand will be projects such as early drone prototypes, new approaches to connecting devices, art made from scrap metal found around Google HQ, and much more. The 'Breaker Lab' will give kids and families a chance to break items in a safe environment -- from baseballs to alarm clocks and more -- in order to explore and discover what when into making them. Google employees who focus on failure analysis and hard testing will be available to share best practices and experiences of being 'breakers' at Google. Google can also be found at the always popular 'Learn to Solder' area at the Faire where Makers of all ages will learn soldering skills by making their very own blinky LED pin to wear. Google volunteers will assist Faire goers with their soldering efforts and provide a safe environment to learn this skill. Tickets are on sale now for Maker Faire Bay Area 2015 at http://mfba2015.eventbrite.com at advance pricing. Advance ticket sales ($20.00 - $35.00 for a full day pass) take place between March 1 and May 15. Tickets can also be purchased on-site at Maker Faire Bay Area 2015 on May 16 & 17, 2015 ($25.00 - $45.00 for a full day pass). Tickets for FRIDAY@MakerFaire can be purchased here. Maker Faire is the Greatest Show (and Tell) on Earth-a family-friendly showcase of invention, creativity, and resourcefulness, and a celebration of the Maker Movement. It's a place where people of all ages and backgrounds gather together to show what they are making and share what they are learning. Maker Faire celebrated 131 Faires in 2014 alone and has reached over 2.3 million attendees globally since it launched in San Mateo, CA, in 2006, less than a year after the publication of the first Make: magazine in 2005. The ninth annual Maker Faire Bay Area welcomed some 1,100 makers and 130,000 attendees. World Maker Faire New York, the other flagship event, has grown in five years to 830-plus Makers and 85,000 attendees. Atlanta, Detroit, Kansas City, Milwaukee, Orlando, Pittsburgh, Silver Springs, San Diego, Paris, Rome, Oslo, Newscastle (UK), Berlin, Hannover, Trondheim, Seoul, Taipei, Tokyo, Singapore, and Shenzhen host our "featured" larger-scale Maker Faires, and community-driven, independently organized Mini Maker Faires inspire and ignite creative communities everywhere around the United States and internationally. Located in San Francisco, CA, Maker Media has been widely credited with jumpstarting the worldwide Maker Movement, which has been a transforming force in innovation, culture, and education. In addition to publishing Make: magazine and producing Maker Faire, Maker Media develops "getting started" kits and books it sells through its Maker Shed store as well as other retail channels. Maker Media is based in San Francisco, and has offices in Sebastopol, CA and at the Palace of Fine Arts in San Francisco. A celebration of DIY culture, Maker Faire Bay Area 2015 runs Saturday-Sunday, May 16-17, with special invite-only access on Friday, May 15, at the San Mateo County Event Center, 1346 Saratoga Drive, San Mateo, CA. Friday, 1 pm to 5 pm; Saturday, 10 am to 8 pm; Sunday, 10 am to 6 pm. $17.50 - $40.00; ages 3 and under are free. http://www.makerfaire.com. To purchase tickets, including weekend passes: http://mfba2015.eventbrite.com. Presenting: Intel; Goldsmith: Autodesk, DFRobot, Google, Italian Trade Agency, Sprout by HP; Silversmith: Air France, Atmel, Cognizant, Dremel, Microsoft, National Aeronautics and Space Administration, ROBLOX, SketchUp, TechShop. 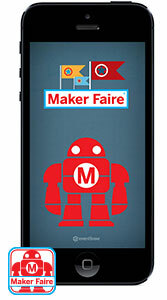 Download the Official Maker Faire Mobile App to access the latest information about the Faire including Makers, sessions and schedules, locations, and more.